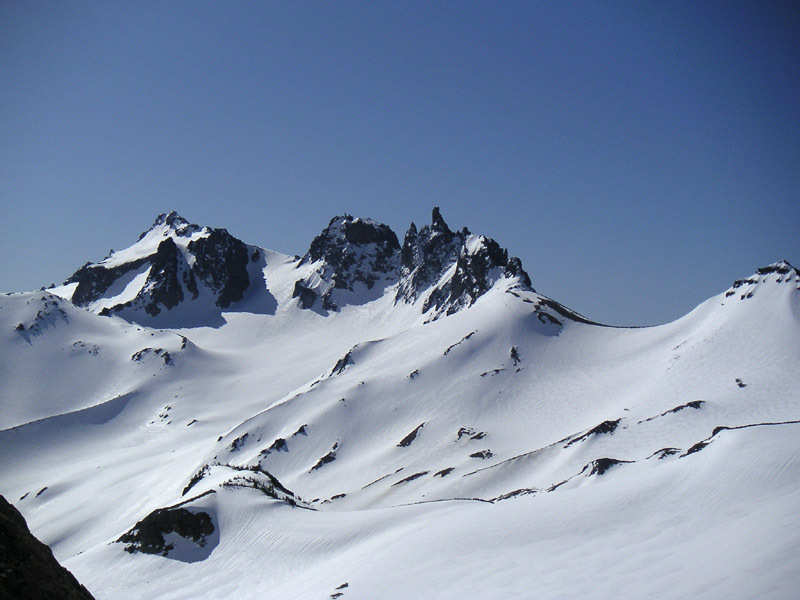 Team O'Brien took to the hills again April 27th through May 2nd for a multi-day tour into the remote Goat Rocks Wilderness area south of White Pass. This was to be a celebration of Jim Mates' 50th Birthday and a reprise of a Goat Rocks spring skiing trip that Mates and Ed Rundle have enjoyed periodically for the last 25 years. As it was to be my first visit to the famed region, I was a bit anxious to get going, but Mates quelled my nervousness with a calming, non-hurried attitude that got me over the butterflies and we settled down to the business of organizing food for the six day trip. Our approach was from the east side of White Pass out the Tieton Road to Scatter Creek trail head, taking trail 1118 to Tieton Pass then on to Lutz lake and McCall basin where we would meet Ed and his cohorts. 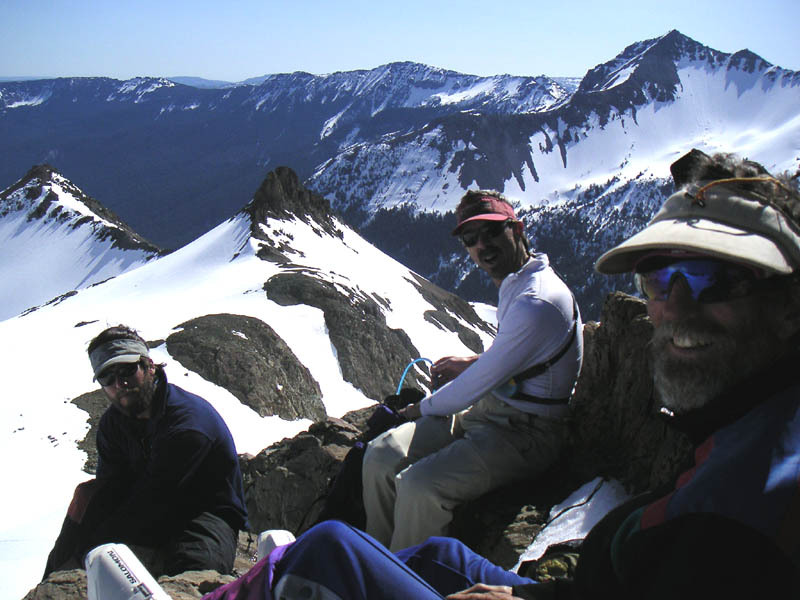 The 7-mile trek included multiple mounts and dismounts - eventually we gave up skiing, put the boards on our packs, and hiked for approximately 2 miles. 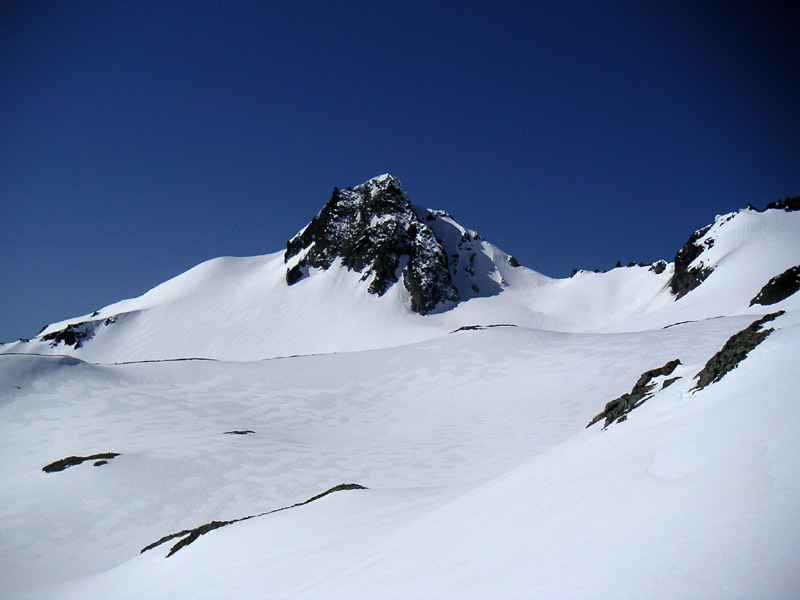 The snow later became continuous again so we mounted up and made it to Tieton Pass on the first night, then continued on to the basin for base camp setup. 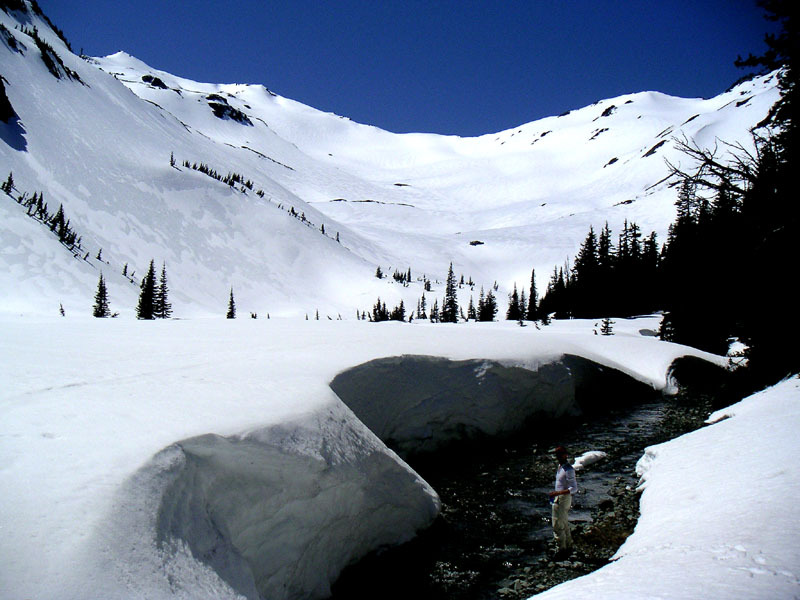 The approach is not for the faint of heart, filled with steep rotten contours that could wash out from under your skis (leaving you sliding down into the creek bed below and having to climb out for another try). I turtled once into a tree well and got pinned under my pack while crawling under a fallen tree (doing pushups with 55 lbs on your back would be a good prep for this one). 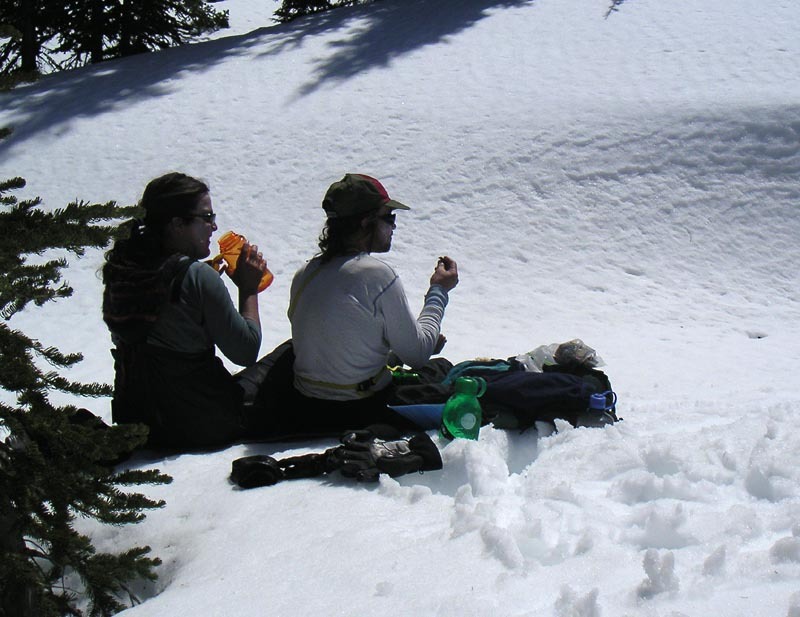 Ed, Owen, Jenny and Brian came in via Hogback Mountain from White Pass and requested that we "leave some beer at the trailhead" as they had been forced to consume (and eject) some quantity of suds soon after their departure. Spring conditions made for consolidated snow and limited avalanche danger. 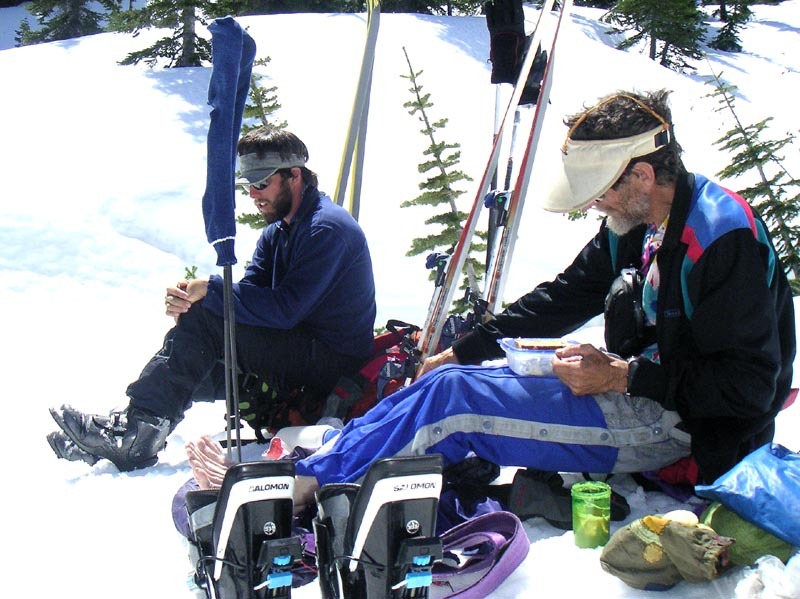 Our leaders Ed Rundle and Jim Mates are both ex-pro patrollers from Stevens Pass, so our learning curve was enhanced by insightful analyses of snow conditions and practice beeper sessions. 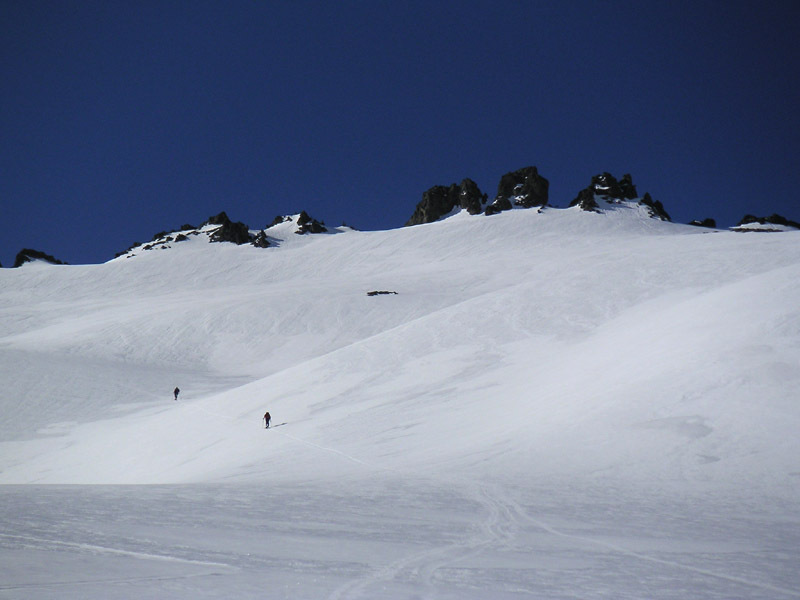 The skiing ran the gamut, from steep couloirs to large open bowls and everything in between. After cresting Old Snowy Mountain (7,800 ft.) we skied 3,000 ft. into the valley for lunch and a drink of fresh water before ascending the rolling hills below Gilbert Peak for another 2,500 ft. descent to base camp and dinner. A day of rest was in order before the return to the trail head. This part of the journey was more enjoyable with packs 10 lbs. lighter and skiing down hill. A fair loss of snow during our stay made the on-dirt part of the descent a mile longer, but steps down seemed easier than steps up so I was happier on the way out. 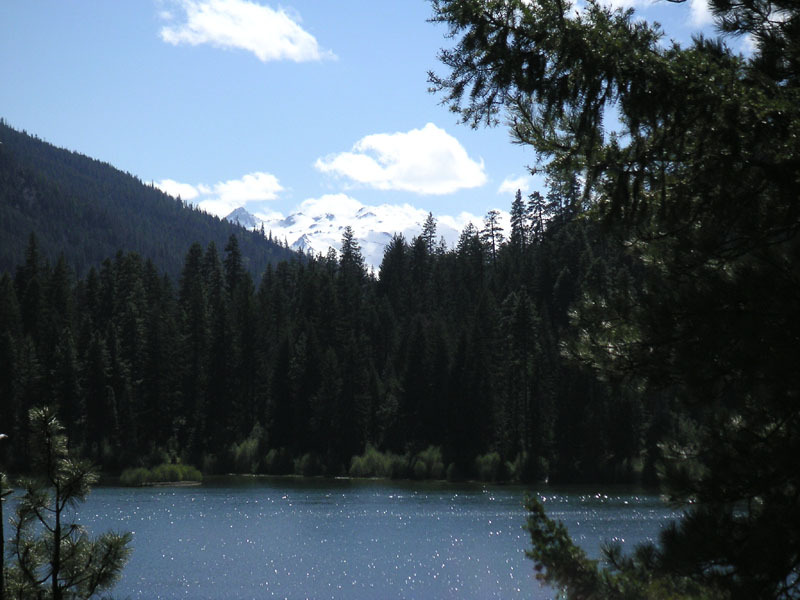 This area is a great spring ski vacation spot. 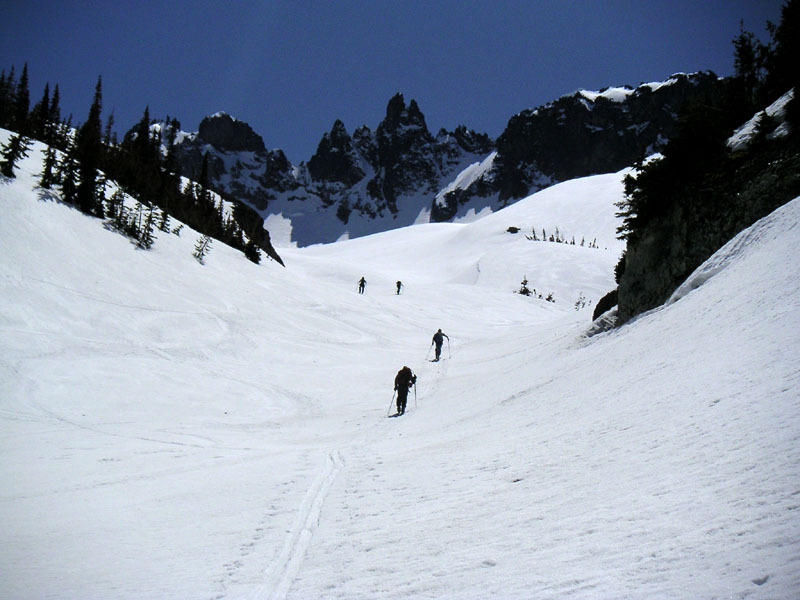 Ed and Jim indicate that very few people have skied this area because it is so difficult to access, but it is worth the challenge of getting into the Goat Rocks Wilderness in the spring for the great skiing and solitude.